A wildfire broke out west of Boulder, Colorado, in early September 2010. Known as the Fourmile Canyon Fire, the blaze broke out around 10 a.m. on September 6, although investigators were still working to identify the cause a day later, according to news reports. On September 6, the Geographic Area Coordination Center reported that the fire had burned 3,000 acres and was not contained on any front. The fire had burned 12 houses and buildings, and threatened 500 more. 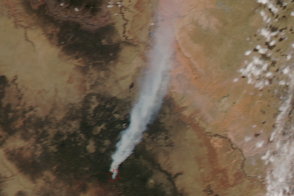 The Moderate Resolution Imaging Spectroradiometer (MODIS) on NASA’s Terra satellite captured this natural-color image of the fire at 12:15 p.m. local time (18:15 UTC) on September 6, 2010. 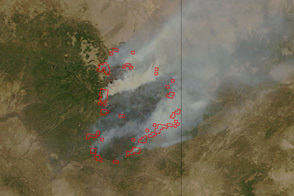 The red outline corresponds with the unusually high surface temperatures associated with an active fire. A river of thick smoke flows eastward. 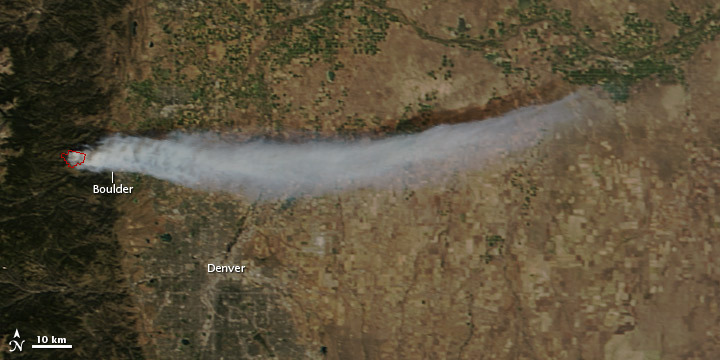 Over the plains northeast of Denver, the smoke plume casts a shadow to the north. 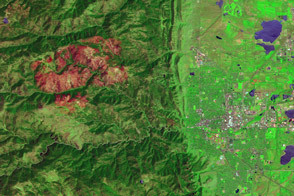 This image shows the city of Boulder lying in the path of the smoke. 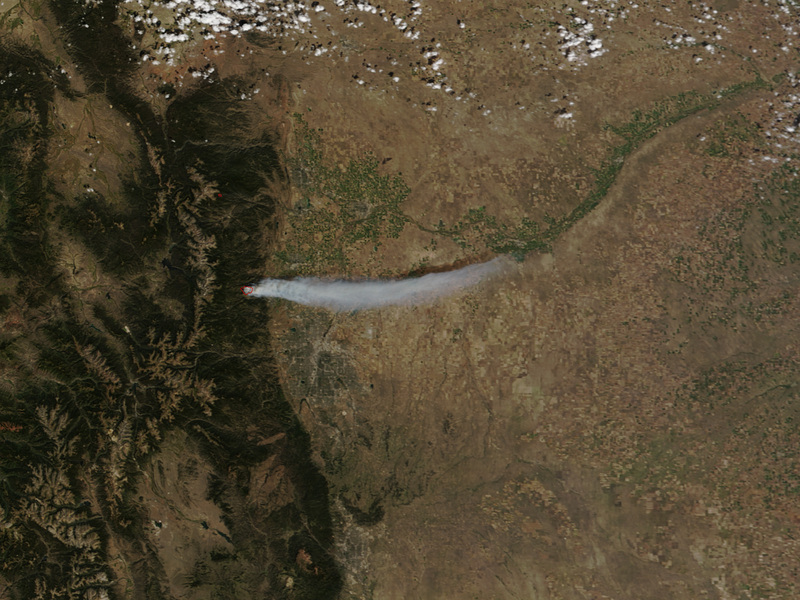 The same day that MODIS acquired this image, Boulder County issued a public health alert warning residents to limit physical activity and remain indoors if possible. On September 7, smoke continued to affect air quality and limit visibility in Boulder. Early on the morning of September 7, news sources reported that the fire was still not contained. 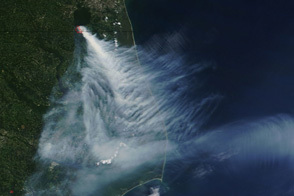 NASA image by Jeff Schmaltz, MODIS Rapid Response Team at NASA GSFC. Caption by Michon Scott. 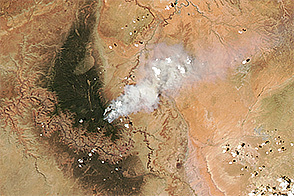 Acquired September 6, 2010, this natural-color image shows a river of smoke flowing eastward from a wildfire west of Boulder, Colorado. 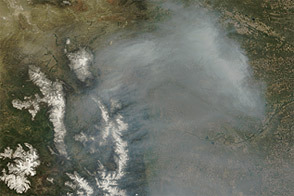 A wildfire broke out west of Boulder, Colorado, in early September 2010, threatening hundreds of structures and bathing Boulder in smoke. Boulder County. (2010, September 6). Public health alert from smoke in Fourmile Canyon area. Accessed September 7, 2010. Geographic Area Coordination Centers. (2010, September 6). GACC summary situation report 9/6/2010. Accessed September 7, 2010. Snider, L., Baxter, J. (2010, September 7). Fourmile Fire: Crews work to contain Boulder County blaze this morning. Daily Camera. Accessed September 7, 2010. U.S. Forest Service. (2010, September 7). Fire information report for Four Mile Canyon. Accessed September 7, 2010.